Are You Performing Wet Applications the Right Way? Wet applications are commonly used for lettering on glass. Do you wonder why your wet vinyl applications never seem to come out right? For certain installations, signmakers may prefer a wet vinyl graphic application process to dry applications for a couple reasons, mainly the temporary ability to reposition the graphic before ultimately sticking it in place. 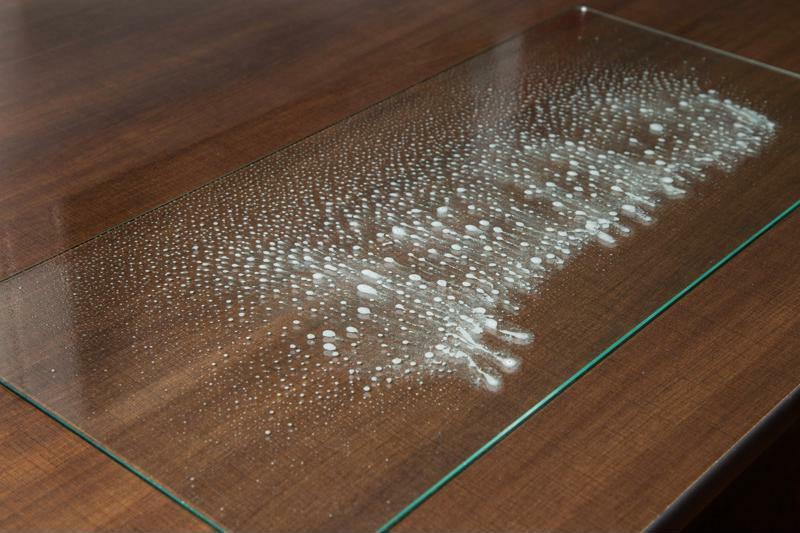 Wet applications also work especially well on glass surfaces. However, some installation specialists may find wet applications to be more trouble than they're worth. After all, they call it a "wet" application for a reason. If not done properly, it is far too easy to make a mess, ruin the application set-up and frustrate customers, all leading to a re-do that'll cost precious time and money. We've said it before, and we'll say it again: Always clean and dry surfaces before applying any graphic. This ensures the success of the installation process, as well as the longevity of the vinyl application. Emphasis on lightly. Some application tapes require a thorough soaking, but if you're using TransferRite, you won't need more than a spritz. If application fluid drips off the surface, you've used too much. Clean and dry the surface again before starting over. Too much application fluid is messy and requires more time for the vinyl to set up. The mist on your surface will be enough to enable repositioning. Spraying fluid directly on the adhesive side of the transfer tape could compromise its ability to transfer the vinyl to your surface. Leave the transfer tape dry for the best results. Lightly stick the transfer tape to the dampened surface. Slide and straighten out the graphic so it's exactly where you want it. Though movable, the adhesion on the transfer tape will hold the graphic in place if you let it go to check how it looks from a distance. "By using less fluid, you shorten the adhesion time." When the graphic is lined up, use a squeegee to permanently set in place. Work from the center out to the edges of the graphic to expel any fluid underneath. Don't be afraid to put some muscle behind that squeegee. Give the vinyl graphic time to adhere to the surface before peeling back the transfer tape. By using less adhesive fluid earlier in the application process, you shorten the adhesion time and accelerate the process overall. After squeegeeing the graphic a few times, slowly pull transfer tape back on itself as opposed to at a 90-degree angle from the surface. Pulling too hard or too quickly could damage the vinyl and send you back to square one. If the vinyl lifts as you pull back on the transfer tape, give the back of the transfer tape a quick spray, reset it against the substrate and wait a couple more minutes. This should help separate the tape from the vinyl on your next try. Once you've given the graphic time to dry naturally, the only thing left to do is congratulate yourself on a successful wet application.